*Forest Crest members receive a 10% discount off listed prices. See office staff for coupon code. **Contact Glenn Delaney at 425-385-8786 to register. Discounts available with multi-class passes. Forest Crest Athletic Club offers private, semi-private and group instruction by certified teaching professionals (USPTA, PTR). The lessons may be set up at a time convenient for both students and the pro. 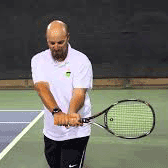 Select Tennis Pros to learn about our instructors.